Despite the chilly weather and threats of rain, folks gathered in the coliseum Monday morning to view the first class of the day, the Grand National Park Harness Four-Year-Old Stallion. Peter Fenton welcomed three fresh entries into the ring, all driven by skilled trainers including Rick Stevens, Gerry Rushton and Craig Clapp. When Lewis Eckard’s, Lonnie Lavery’s and Phil Price’s cards were turned in, Stacy Hennessy assisted Gerry Rushton and the nicely cadenced stallion of Greg and Linda Miller’s, Stonecroft Notorious, in making their victory pass. Craig Clapp was behind the lines of the powerful Intrepid Dynasty for reserve under the ownership of Debra Woolley Lee and Donna Woolley. Toning it down a notch, the classic horses made their way to the ring next for the Grand National Classic Pleasure Saddle Stallion and Gelding 15.1 and Over class. Coalition X-Static and Paula Messier maintained a perfect position on the rail throughout the class and were rewarded for their classic style with the unanimous win for Megan Place. Deborah Davies did a fine job presenting the reserve champion, Canalta Squire King for K-Lyn Stable. 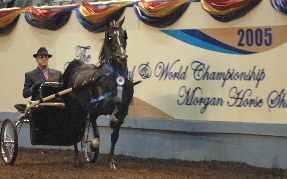 The 11 and under junior exhibitors and their pleasure driving Morgans had their showdown next. Small but mighty, Ariana Varveris did an excellent job showing off her mannerly yet showy True Gold to the unanimous victory. In his first trip to the Oklahoma coliseum Austin McLallin put the pressure on for reserve with On A Mission MEM for Cathy Hazen. The classic horses were back and on this morning a group of 13 quality mares with an international flaire all the way from Canada to the United Kingdom competed for the grand national victory. The winning team of Goldencrest Aleksis and Inge Johnsen, who hail from Canada, enjoyed another trip to the winner's circle as Bill Grundmeyer greeted the champions, who received two first place votes. Reserve went to the polisehd bay JW Gay Paree and Lisa Holt for Holt Oaks Farm LLC. The Grand National Park Harness Ladies Gelding featured a unanimous decision for the dynamic HVK Constantinoble with Stephanie Connor on the lines in the victory area starting off the day with a blue ribbon for the Arcuri Stables tack room. HVK March Flaire followed in reserve with a fine showing with Jacqueline Clapp driving. The previous park harness class was a perfect way to warm up the crowd for the next class, the Grand National Park Saddle Junior Exhibitor 15 and Under class. Again in perfect agreement with one another, the judges believed Ultra’s Dark Angel and Katherine O’Connor to be the very best of this division. Ultra’s Dark Angel, the 2004 Three-Year-Old Park Saddle World Champion, enjoyed another trip down Oklahoma's victory lane competing this year for owner Laurette Walsh under the direction of David Young. Marathon’s Electrafire and Anna McLallin received a warm round of applause for their reserve efforts for Jacqueline Clapp to continue a busy day for PlayMor Farm. 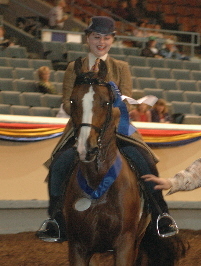 Following in her mother’s footstep and becoming a fine young horsewoman, Katherine Alderman and the upheaded bay AFF Leroy Brown added yet another victory to their fabulous 2005 résumé. The two time defending world championship team in this division, Carl Johnson and HVK Primary Light represented the South for the reserve ribbon for Frances Pugh and Holly Johnson. The efficient show officials continued to keep things rolling along swiftly as the call was next made for the Grand National English Pleasure Mares. Stan Bodnar and the flashy chestnut with three white socks, Futurity Chicago Whitesox, bested the field of eight, earning the national title for team Merriehill. Taking reserve back to the Northeast, Ann Anderson garnered reserve aboard Minion Starlett for Livingston Morgans. Quality was the name of the game in the next class as Lonnie Lavery, Euchee Matthews and Lewis Eckard really had their work cut out for them as the Grand National Pleasure Driving Amateur Stallion class was filled with well-known, successful contenders. Another winner coached by David Rand, the upheaded Tolstoy, with Jack Gatewood on the lines, was exquisite for the unanimous victory in the competitive class. They earned the crowd-pleasing win for DanTree Farm. 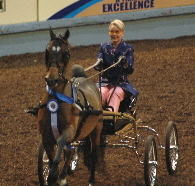 Donna Zimmerman was thrilled with her outstanding drive and reserve finish, behind the lines of The Last Don. The morning continued with its largest class as 20 impressive entries filled the ring in the Classic Pleasure Saddle Stallion/Gelding Under 15.1 Hands. Boogie Nights has set the standard in the division in his first season and his first Oklahoma performance netted him the unanimous victory with Dawn Fire in the irons for Peeper Ranch. Top riding Debra Hurst Walters matched up with the always bright AMHF Absolut Mystery for the reserve finish. The morning session closed out with the Two-Year-Old Pleasure Driving Geldings as TE Ammunition had the right artillery to earn the victory with Stan Bodnar on the lines for Bonnie Adams and Tazewell Enterprises. Jason Wolfe had the fronty chestnut RJMF Barrymore well prepared for his Oklahoma debut to garner reserve honors for Robert Morgan and Morgan Horse Farm. After about an hour-and-a-half break for lunch, Monday’s second session convened. The Grand National Pleasure Driving Three-Year-Old Mare competition got the action off to a great start. The judges had agreed on six out of 11 winners in the morning session and they started the matinee session off with another unanimous decision as the Sebring Stables trained CBMF Infatuation and Rodney Hicks emerged from the lineup as the blue ribbon winners for Copper Beech LLC. MEM Twisted Sister and Phil Fountain finished second in the field of nine with a stylish drive for Lynn Begalla. The Grand National English Pleasure Ladies Amateur Mare class shaped up to be a most competitive class as 14 high caliber campaigners met face to face in hopes of wearing the blue ribbon out of the coliseum. There was no question that IGF What’s The Question, with two top votes from the panel, had champion written all over her pretty face. Riding from Lowry Stables, Lynn Muir was aboard the champion for WSS Prestwick Farms. Versace with Karie Miller in the irons turned on the heat for reserve honors for Donna Woolley while Carolyn Gibbard polished off the top three with her always competitive mare, About Last Night. Another crop of fine mares worked the ring next as Peter Fenton called for the Grand National Pleasure Driving Two-Year-Old Mares. Tim Roesink was in the presentation area again after Barbara Lindauer’s bright and showy HVK Sweet Obssession was named champion. 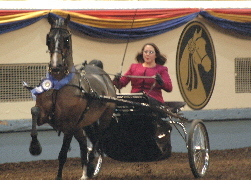 Willowick Center Stage and Mary Brannon cruised out with the red ribbon in hand following an eye-catching drive. It was a family affair in the 12-entry Grand National Youth English Pleasure Finals. Cousins Caitlynn and Christin Ramsey, both under David Rand’s expert guidance, finished first and second, respectively. 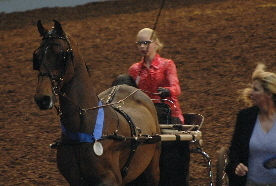 Caitlynn captured the tricolor aboard the big-trotting, white-faced chestnut Lookaway’s Hot Ticket. It was a memorable class indeed as following his reserve championship presentation it was announced that it was the final show ring performance for the great champion Merriehill Hooligan. Every bit a champion, Merriehill Hooligan, one of the winningest pleasure horses of all time, closed out his storybook career wearing the reserve streamers out of the ring ridden by Christin Ramsey. Another class in the double-digits, the Grand National Pleasure Driving Three-Year-Old Stallion and Gelding entered the ring next. Bob Kellert had TRE Master Of Disguise in all the right places for the win for Debra Hurst Walters to add to his outstanding record of Oklahoma in hand accomplishments. Representing Dragonsmeade Farm, the well received Dragonsmeade Carnaros and Mike Carpenter accepted the second place streamers. With a brief break from the afternoon’s performance classes, the Oklahoma audience steered their attention toward the Morgan dressage champions of the world. Following hundreds of rides in the division during the show's first three days, the dressage athletes were honored with their high point world champions earning center ring recognition. Following the dressage presentations, the four-year-old park harness mares and geldings made their way into the coliseum to be judged by Lewis Eckard, Lonnie Lavery and Phil Price. At the conclusion of the class, attendants literally raced into the ring to greet their entries, much to the crowd’s delight, and it seemed to be a unanimous decision that Ron Roesink topped this field of four. As far as the horses in this class go, Boxford Bulls and Bears and John Warner carried the unanimous winning ticket home to the Blevins family. Grove Pointe’s outstanding week continued as CBMF Solitaire and Tim Roesink were named the reserve champions for Copper Beech LLC. The action continued as another large group, consisting of 18 amateur lady riders and their pleasure geldings, worked the grand national ring in an attempt to earn the judges’ approval. Stephanie Connor had the ride she’d been waiting for on this day as she and her impressive gelding Man In Command bested the field under the guidance of Tim Arcuri. The number two position belonged to Rampaige and Lisa Howa making a bold statement in their first saddle competition in Oklahoma. The fancy chestnut NAS Rickenbacker rounded out the top three with Nancy Murdock in the irons. The judges next evaluated the two-year-old pleasure driving stallions, driven by veteran trainers including Gerry Rushton, Mike Carpenter, Jim Lowry and Jeff White. The crowd agreed with the judges’ unanimous choice of the bolding-moving Sacred Path Indiana Jones and Jim Lowry. Presenting this time for Diane and Lon Seitz and Sacred Path Morings, this was Lowry’s second victory pass of the day. Jeff White and MEM Blue Chip made a strong effort for reserve for George Schott and Maine Event Morgans. The good session continued with the Grand National Park Saddle Junior Exhibitor 16 & 17 class. A flawless performance put the eye-catching pair of On Eagles Wings and Gillian Nelson, with first place votes from Eckard and Matthews, in the number one spot as Tug Hill Gunns And Roses and Catherine Hendrickson park trotted out of the ring with the red ribbon in hand. Closing out the performance classes on Monday afternoon, the park harness mares and geldings demanded the crowd’s attention with their big personalities. Stonecroft Sudden Impact and Jaisen von Ballmoos emerged from the lineup with the unanimous approval from the panel for Robert and Loek Neimeth. Lark Henry took over the reins of SpringMill Navigator for a last minute catch-drive that netted the reserve ribbon. 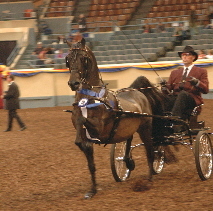 The World Champion Carriage Pleasure Driving Single class was the second to last class of the afternoon and top two prizes ranged from coast to coast. The natural-going HVK Hard Rock and Tristanne Weber-Childress prevailed in the class for Marilyn North, Mooresville, N.C., while Samac’s Black Tie Affair and Cathy Grimes for Alton Page, San Jose, Calif., turned in a bold drive for the reserve award. The World Champion Carriage Pleasure Driving Multiple competition wrapped up the session with one beautiful pair and one beautiful tandem-style entry showing for judge Muffy Seaton. After working at the walk, slow trot, working trot and strong trot Seaton chose Denbury Regal Justice and Denbury Irish Justice to be the champions with James Brown directing the pair. Reserve went to Stormy Tasha and Canabar Kokopelli, presented by Mai Wisdom. The Monday evening session was off to an alluring start as the Grand National Park Harness Ladies Mares kept the excitement at a fever pitch. In one of the most awaited classes of the show thus far, five entries got the night started off just right. It’s always nice to hear that the judges are in agreement and on this day, many classes concluded with unanimous decisions, including the first class of Monday evening. Helen Crawford and HVK Ancient Cry made the session’s first victory pass to return to Oklahoma glory for Boston Morgans. Arboria Victor's Pride and Sandy Sessink were reunited to earn the reserve ribbon for Arboria Morgans directed by Tom Johnson. The hunter division is always a strong division and the Grand National Hunter Pleasure Mares class was no exception. John McDonald, Joyce Swanson and Buck Grass judged the class and when their cards were averaged by the computer system, Shaker’s Maribeles and Mary Carlton were crowned champions for the second year in a row for Judy Fox. Bill Carrington announced the well named VVM Simply Elegant and Jennifer Baskinger to be the reserve champions for Richard and Rosemary Zick. . It really felt like the Grand National when the sound of the horn filled the coliseum as eight open pleasure geldings entered the ring. For the third time today, Jim Lowry directed the winning entry. This time Lowry expertly guided the charismatic Century Mardi Gras to the victory for Randall and Laine Vincent. Burkland Rafinesque and Keith Nelsen trotted out as the reserve champions for Chris and Janet Morris of Paradise Morgans. The young riders of the industry converged next for the Grand National Western Pleasure Junior Exhibitor 12 & 13 class. Happy to do his job in style, the well-mannered Chisholm, with Leah Soubel up, received a warm applause for their victory. Anna McLallin was teamed with the handsome Bear Brook Supreme Bar to earn the resreve finish coached by Sammi Hazen. The pace picked up in the next class as the Grand National Pleasure Driving Amateur Gelding performance got underway. With his ears perked up for each and every pass, WSG Circumstan’l Evidence showed what it meant to be a show horse. Priscilla Marconi was on the lines of the champion for the unanimous decision prepared by the Indian Creek team. RJM Roulette and Janet Morgan captured the second position with a stylish drive in the 10-horse class. The call for the Grand National Hunter Pleasure Stallion and Gelding Under 15.1 followed and with that came 11 competitive entries. Representing the West Coast, Julie Chan had Manhatten Royal in perfect order for Shirley Rosenberg to add to the blue ribbon laden Garn Walker Stable banner. Stone Pine Sebastian and Kelly Kraegel-Bates heard the crowd’s appreciation for their reserve effort for Marilyn Esteb of Stone Pine Farm LLC. As the gate closed for the Grand National English Pleasure Stallions class, a plethora of trainers and owners gathered in the gate area to watch one of the most talked about classes of the evening. That group paired with the fans in the coliseum stands roared when Bill Carrington announced 261 to be the unanimous champion. The popular Stonecroft Byzantine paraded out of the ring as the champion with Anne Benson in the irons for Heidi Kunkel. The powerful performing WSG Wham-O and David Rand exited the ring as the reserve champions for Jill and Steven Tassinari. The Grand National Amateur Pleasure Driving Mare class answered the next gate call. Under the Dragonsmeade banner, Iann Fu Longenecker and Dragonsmeade Divine Miss M made the bold performance for the unanimous win. Noelle Renouf and DreamMaster J’st Sharper were sharp indeed as they collected the reserve prize for Bill and Connie Myers. As the night began to wind down, six western stallions entered the ring with their amateur riders aboard. A smooth sailing ride put Gulfwind Sir William and Margaret McKnight Karrh in the winner’s circle to add to a great season for Paul and Evelyn McKnight. Cabot French Lieutenant and Kathy Papola jogged out with the red ribbon in hand to add to their storied Oklahoma career for Baccarat Farms. Pat West and Chase Manhattan displayed quality and style as they collected the yellow ribbon in this deep class. lines for Sheryl Bartolucci. 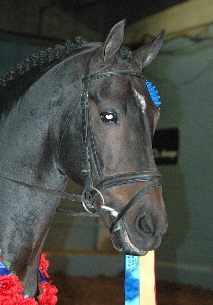 The 2005 New England Park Harness Champion CVH Celtic Command, was presented masterfully by Bernard Parker to the reserve finish for Catherine Haynes. Monday morning was a bit dreary with rain threatening outside, but entries sparkled inside Show Arena 6 as four beautiful turnouts in the GN Versatile Morgan Finals opened the day’s competition. The vehicles shone, some with immaculate patent leather and brass, and others with gleaming polished wood. After performing in the driving phase, horses stood quietly while being unhooked and then saddled for additional work. All entries performed rail work under saddle and then took two jumps each. Performing all phases with equal skill and consistency was the team of Wintergreen Sultana and Jill Countryman for a popular win. This was the second year in a row for this duo to take the blue back to Bittersweet Farm. Close behind in reserve were Big D Conmigo and Irene Nedved. Next on tap was Hunter Pleasure Ladies Amateur Mare with 15 competitive entries. Glacier Dreamin’, looking every bit the epitome of a ladies horse, and Monty Kuegler earned the Grand National win directed by The River's Edge. The unanimous approval of the judging panel made the win even sweeter. Reserve were Andrea’s Radiance and Sara Hefferman who notched their best Grand National finish to date. Western Pleasure Three-Year Mares featured 10 future stars of the show ring. It’s always gratifying to peak at just the right time in a show season. For Scandias Mademoiselle and Erin Silver, today was that right time. This big win made the long trip from Oregon most worthwhile for owner Kathleen DeFazio and Scandia Morgan Farm. With charisma to burn, Briar Oaks Frisky Byzness was a close reserve with Kelly Kraegel-Bates in the saddle for Denny and Toni Maunder of Morgans of Briar Oaks. Ladies Hunter Pleasure Geldings was equally split with 13 entries in each section. In section A, En Excess NKS, stood out of the crowd and caught the judges’ attention as well. Julie Chan’s face lit up when Bill Carrington called her number out for first. The multi-titled team was met in the winner’s circle by Garn Walker. Reserve in this competitive class was former reserve world champion Night Out and Jennifer Gray who are on track to repeat past successes. Garn Walker met his second winner in a row when the world champion team of GPM Genesis B and Melissa Walker were called out for first in Section B. With a beautiful ride, Melissa was thrilled to earn their second win in three years in this class. FCF Valparaiso, with Jennifer Cooley up, had a fluid, ground-covering stride to take reserve in the quality-filled class. After wins across the country from the Northwest to the Midwest, Whitney Hazen had her parents’ Bear Brook Supreme Bar in top order to win the Western Pleasure Youth Finals. Jessica Marino and Tampa Bay had plenty of crowd support as they jogged out with the reserve streamers for owners Erin and Marie Thomas. Though never in doubt, twenty-one entries proved the popularity of the Morgan as a hunter pleasure horse in the largest class of the morning - Hunter Pleasure Stallion or Gelding 15.1 & Over. Having begun to develop a good resume in the Northwest, STM Victorys Sharpshooter secured the first Grand National victory of his young career with Carmen Hobson in the saddle for Wesley Hobson. Emerging on the scene this season with a trail of victories D Bar J Habakkuk and Amanda DuPont-Pauli earned the reserve honors for Julie Strasser. With virtually imperceptible cues from Erika Mitchell and PLF Rare Elegance were the judges’ unanimous choice for the Western Pleasure Amateur Mare victory. This beautifully coordinated pair took their victory with vocal support of the crowd for Jim and Natalie Maloof. Stephanie Shearer and her grand national champion mare, Delawares Night Life, had a solid and consistent ride for second. Twelve 14-year-olds on their hunter pleasure horses answered Bill Carrington’s call to the ring. For their second blue in three days, Jordan Cusuamano and BlkOrchid Ace Commander were the unanimous pick of the panel. This grand national and world champion pair are making themselves at home in the winner’s circle at Oklahoma City. Alisha Fowler piloted CHC Blue’s Shining Star to a well-deserved reserve finish for Stacy and David Rutledge. As a former three- and four-year old grand national champion, this young mare is building quite a record in the junior exhibitor division under the Illahee banner. Closing out the morning session, eleven 15-year-olds answered the call for hunter pleasure. 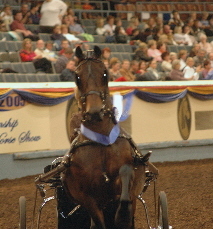 With an outstanding season in 2005, Twin Peak Heritage and Shannon Fox were recipients of the fourth unanimous decision of the day in Show Arena 6. They were met in the winner’s circle by Mary Cockriel. Taking over from Leslie Hunt, Rachel Colley had a effortless ride on Treble’s Fancy Fellow for reserve. Owned by Tiffany Decker, this horse has amassed quite a fancy record in California over the past couple of years. Opening the afternoon session, twenty equitation riders vied for 10 spots for the AMHA Saddle Seat Gold Medal Finals. After performing their rail work together as a group, each came back individually for pattern work. The ten selected for the finals later in the week are (in back number order): Tiffani Earehart, Jamie Cruz, Brooke Gove, Kali Erin Hutchinson, Holly Carlton, Ashley Dragan, Marlo Franco, Emily Buchanan, Katie Goodpaster, and Brooke Yule. Next up was a complete change of pace with the GN Western Pleasure Three Year Old Stallions and Geldings. Fifteen horses answered the call. With the approval of the audience, Treble’s Mucho Uno was “numero uno” in the judges’ view as well. Guided by Daryl Hopson, this youngster, in only his second show, looked like a seasoned veteran. Reserve in this deep class were VQM Till There Was You and Kelly Kraegel-Bates for Kathi Jensen and Vision Quest Morgans. In yet another large, quality–filled class, the ladies on their hunter pleasure geldings gave the audience plenty to admire. Dragonsmeade Crescendo and Keely Sogoloff extended their outstanding season with a clear-cut win for Dragonsmeade Farm. Second in the class of sixteen was Carreg Wen Nocturnal Hawk with Amanda DuPont-Pauli up for John and Nancy Hendricks. Having a simply marvelous ride in Western Pleasure Amateur Gelding 15.1 and Over, owner/rider Virginia Adams piloted He’s Simply Marvelous to the win, this team’s fourth year in a row for a grand national title. With national and regional titles under her belt, Julie Chan graciously received the reserve streamers on DLH Dakota Blues. Garn Walker was the trainer for the top two ribbon winners. The amateur masters were next up on their hunter pleasure horses under 15.1 hands. Paradigm Pagentry and Cara Lynne Schengrund teamed up for their first grand national under the direction of Lynn and Kathleen Peeples. Raintree Ala Bella and Sandra Nelson turned in a stellar reserve ride for Dragonfire Farm. Twelve western pleasure amateur geldings under 15.1 answered the call, with Mirador Magellan turning in the top performance for Natalie Longo in their first trip together to Oklahoma City. Lori Gajowski is the trainer for owner Mariann Brown Carrasco. Foxmoor Legend is the epitome of the versatile and adaptable Morgan having served as Carolyn Karasarides’ amateur mount, Chris Karasarides’ junior exhibitor horse, and Shelby Clark’s hunter walk-trot mount. Carolyn Karasarides was in the saddle this time for a coveted grand national reserve. Eight 16-year-olds showed their hunter pleasure horses to their best advantage. Ashley Wright and Kane Creek Oregon Reign made their first trip together to Oklahoma City an exciting one with a convincing win. They show under the direction of Mary Carlton. The veteran team of Fortuneaire and Bethany Brill have forged a multi-faceted career in both hunter pleasure and dressage. Today was their turn for success in the pleasure ranks, earning a good reserve. With the sixth and last unanimous vote of the day awarded to Star of Midnight, Virginia Adams visited winner’s circle for the second time today. The former four-year-old world champion mare had already earned a 2005 grand national title with trainer Garn Walker. 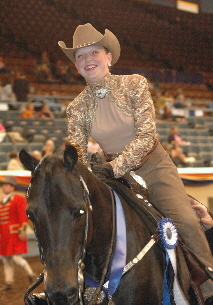 Reserve was the former world champion junior exhibitor horse, WDD Wild Thing with Judy Jajtner up for Haley Coplen. The hunter pleasure for 17-year-olds was fifteen entries deep. After earning a second place earlier in the day with owner Jennifer Grey in the irons, Night Out moved up one notch for rider Laura Pecherski. This versatile rider is building quite a record under the direction of Katie Mair. The team of BMF Take Down The Flag and Whitney Hazen improved last year’s results to earn a well-deserved reserve. Closing out the day’s session was the Western Pleasure Four-Year-Old Stallion/Gelding. An eye-popping twenty horses answered the call. Metolius helped put Garn Walker in the winner’s one more time as they emerged victorious from the crowded field. The reserve world champion futurity three-year-old is even stronger as a four-year-old. 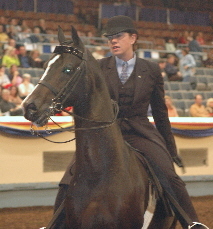 Wintergreen Colorado, ridden by Julie Adams for Ann Taylor, were reserve in the deep class. Dressage competition concluded today with seven classes. First up was training level test 4 open. Here the versatile Rough Diamond Flashback and Alejandro earned the top score for Rough Diamond Ranch. Wintergreen Sienna and Susan Garmier picked up the red ribbon for Ann Taylor. The always entertaining Dressage Musical Freestyle Finals saw WTR Chocolate Bar and Marlo ViVinzio add to a winning show for Wendy Gray Bizzaro. 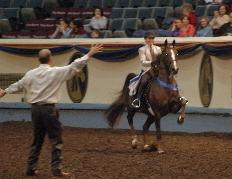 Cindra's Peek A Book earned the reserve score for Karen DeBlaay and rider Leigh Kennedy. The competition continued with first level test 4 for open competitors. The wins kept coming for SGP Raizin Kane with Lynne Salewski for owner Christine Laine. After winning test 2, Wintergreen Don Diego and Susan Garmier placed reserve for owner Ann Taylor. In the amateur section of first level test 4, Natalie Jensen and Dragonfire Kirin completed a sweep, winning all four first level tests for Dragonfire Farm. Derwanda Hercules and Gayle Davidson were reserve. Two junior exhibitors braved first level test 4. Cin O Rama Savoir Faire and Serese Reed earned their second first level blue. In reserve was Kathryn Murphy aboard Coulee Bend High Velocity. Four competitors met the challenge of fourth level test 3. Making it three for three were Wintergreen Fortune and Susan Garmier for Potter Investment Co. Marlo ViVenzio took reserve on Greentree Ever Reddi Wendy Gray Bizzaro. For their second win, David MacMillan and West Mt Christopher conquered second level test 4. Trading positions in several of the tests, this time Northern Exposure and Kathy Padgham were reserve. The results were the same earlier in second level test 2. Marlo ViVenzio and WTR Chocolate Bar, owned by Wendy Gray Bizzaro, put on a solo exhibition in third level test 3. 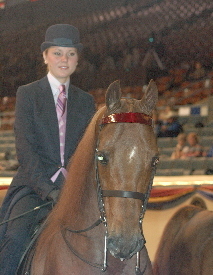 In the show’s dressage finale, two competitors met in Above Fourth Level Test Of Choice Finals. Making it a complete sweep of the fourth level tests were the tried and true team of Wintergreen Fortune and Susan Garmier for Ann Taylor. West Mt Winston and David MacMillan were the reserve finalists. On Monday afternoon Show Arena 9 shifted to over fences competition. An impressive 17 entries filled the Low Working Hunter I class. Susan Garmier and Wintergreen Don Diego are familiar faces in the dressage ring and showed their versatility by winning over fences. In reserve were the team of Melendy Cash Bonus and Kelsey Robinson for Laurel Robinson. In the Jumper I class, That’s My Nick and Amanda DuPont-Pauli were first after several winning results earlier this year. In reserve were Wintergreen Commando and owner/rider Geneva Milliken who also successfully compete in the hunter division. Show Arena 9 featured carriage driving on Monday evening. In Dressage Driving Preliminary Level Single/Multi, Samac's Black Tie Affair and Cathy Grimes won a big class of nine entries for owner Alton Page. In second were Stormy Tasha and Peggy McLinn for Mai Wisdom. Six entries vied for honors in the Dressage Driving Intermediate Level Single/Multi. Coming out on top were Beta B Protocol and owner/driver Mary Shurtleff who have garnered an impressive record in New England over the past few years. Reserve honors went to Samac's Black Tie Affair and Cathy Grimes who had just won the preliminary level.